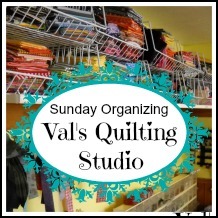 Val's Quilting Studio : Sunday Organizing Linky Party Begins!! Thus, the creation of my Sunday Organizing Linky Party! I mean who doesn't love a linky party! We can share our tricks and tips for organizing our quilting/sewing tools and areas and get a peek into each others "sewing" domains too! Click on my: Sunday Organizing Page for specifics and come back Sunday for our first link-up! So for now, we are off to visit our daughters this weekend. Don't laugh, but we are going to help our newly wed daughter organize her house. LOL!!! I'm serious! I'll post our first Link-up Sunday...I can't wait. What a fabulous studio you two have. I love the fact that work together in that room! Ooh - can't wait!! I hope to be back on Sunday!